A wide range of American companies has joined in the #LoveWins Twitter response to the June 27 decision of the Supreme Court of the United States (SCOTUS) 5-4 decision to legalise marriage equality throughout the United States. 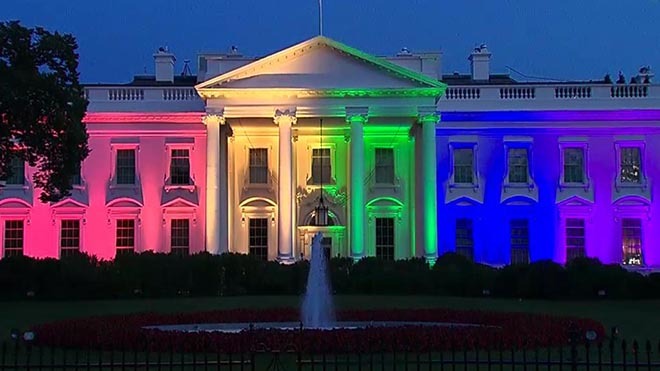 Leading the online celebration are Barack Obama with two tweets, and The White House, with a photograph of the White House lit up in rainbow colours. The Twitter hashtag, #LoveWins, was used to connect brands with the marriage equality cause, while many Twitter logos were given a rainbow treatment. Marketers in many cases would have been ready with design prepared for Pride celebrations in the USA. Brands featured here: Abercrombie & Fitch, Absolut Vodka, The Academy Awards, Ace Hotel, Adidas, Adobe, Air BnB, Alaskan Airlines, American Airlines, American Apparel, American Express, Amnesty, Android, Apple Music, AT&T, Bank of America, Barneys New York, Ben and Jerrys, Bing, Boing Boing, Bravo TV, Budweiser, Burt’s Bees, Buzzfeed, Caesar’s Palace, Cheerios, Chipotle, Chobani, Citi, Coach, Coca Cola, Colombia, Coors Light, Crate & Barrel, Delta, Deloitte, Doritos, Dove, Dove Men Care, Dropbox, Electronic Arts, Equinox, Expedia, Fitbit, Fresh Direct, Gap Inc, Game of Thrones, Gatorade, General Electric, Goldman Sachs, Google, Groupon, Hallmark Cards, Heineken USA, Hersheys Kisses, Hilton Hotels, Honey Maid, Hoot Suite, HTC USA, Hubspot, Hyatt, Hyundai, IBM, Intel, Jello, Jet Blue, Kelloggs US, Ketel One Vodka, Kettle Brand Chips, KFC, Kool Aid, Logo TV, Lush Cosmetics, Lyft, Macys, Major League Soccer, The Marriott, Mastercard, Match, Method, Miller Lite, Microsoft Lumia, NASDAQ, New York Life, OITNB, Old Navy, One Plus, Orbitz, Pandora, Pepsi, PETA, Pfizer, Powerade, Procter & Gamble, (Red), Rock Band, Sears, Shake Shack, Skittles, Skyy Vodka, Smart Car USA, Smirnoff, Snickers, Spotify, Sprint, Staples, Starbucks, Stuart Weitzman, Symantec, Target, Threadless, Tide, Tiffany, T-Mobile, Totinos, Trident Gum, Tumblr, Uber NYC, UGG Australia, Uniqlo USA, Vegas, Vine, Virgin America, Visa, Walgreens, Walkers Crisps, Wattpad, Weather Channel, Wells Fargo, Whole Foods, Xerox, Yahoo, YouTube, and Zurich Insurance. With Liberty and Justice for all. #HyundaiProud celebrates #MarriageEquality. Today #LoveWins. A great day for EVERYONE in the US!